The most important printing method today is pigment printing. This involves printing the colored pattern onto the fabric surface and curing the printed areas by heating in air. The print paste contains colored pigments and a binding agent. On curing in hot air, the binder forms a solid film of transparent polymer that holds the pigment in place on the yarn surfaces. The great advantage of pigment printing is that the fabric does not require washing after the fixation process. Soluble dyes used in printing a fabric are f the same types as those normally used to dye it a solid color. Apart from in pigment printing, the usual sequences of operations in printing, drying, steaming and washing. As there is only a limited amount of condensed steam, dyes for printing must have high solubility. The paste must dissolve the dyes to allow their diffusion into the fibers. It will also contain all the other required chemicals for fiber wetting and dye fixation. From the printed surface, the final washing removes the unfixed dyes, thickening agent and other auxiliary chemicals. During washing, it is critical that the dyes removed do not stain any white ground or other printed areas. Depending on this causes, dyes for printing often have relatively low molecular weights so that their substantivity is not very high. When manufacturer sells the same dye for both dyeing and printing, the two product formulations will invariably be different. The rapid development of CAD (computer aided design) computer systems for print design has had a significant impact on this activity. The development of digitized textile printing using, for example, ink jet printers is well underway. 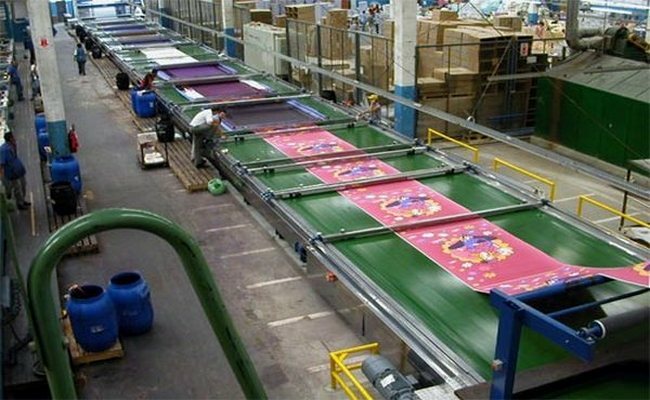 Such computer assisted manufacturing will considerably influence the textile printing industry in the near future. Its other preoccupation, as for the dyeing industry in general, is that of reducing the amounts of biodegradable and potentially harmful chemicals in the effluent leaving the works so that its environmental impact is limited.